5 YEAR FULL WARRANTY ON THE LG-7500! 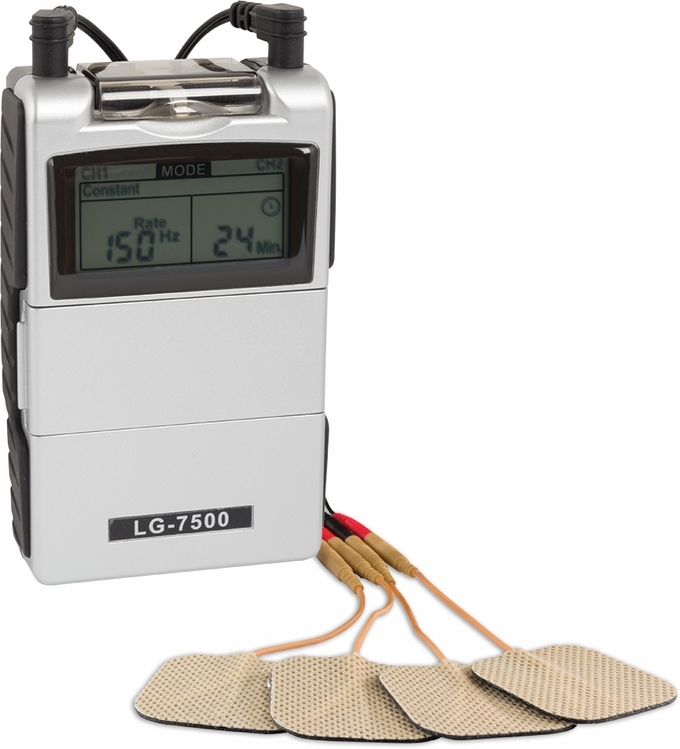 The LG-7500 Digital Electrical Muscle Stimulator is a proven way of treating muscular injuries, muscle atrophy, and rehabilitation. 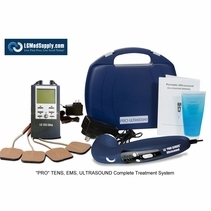 It works by sending electronic pulses to the muscle or muscles needing treatment. This causes the muscle to contract and exercise passively. 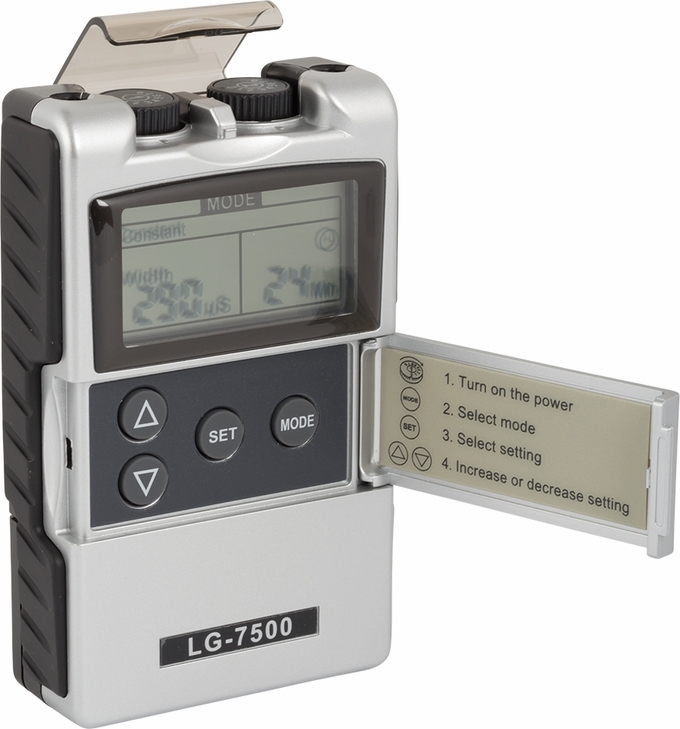 The LG-7500 is a Digital Muscle Stimulator comes with an easy to read LCD Screen. 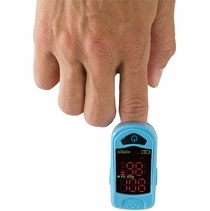 You can easily control the intensity, pulse width, and pulse rate to determine the best individual setting. 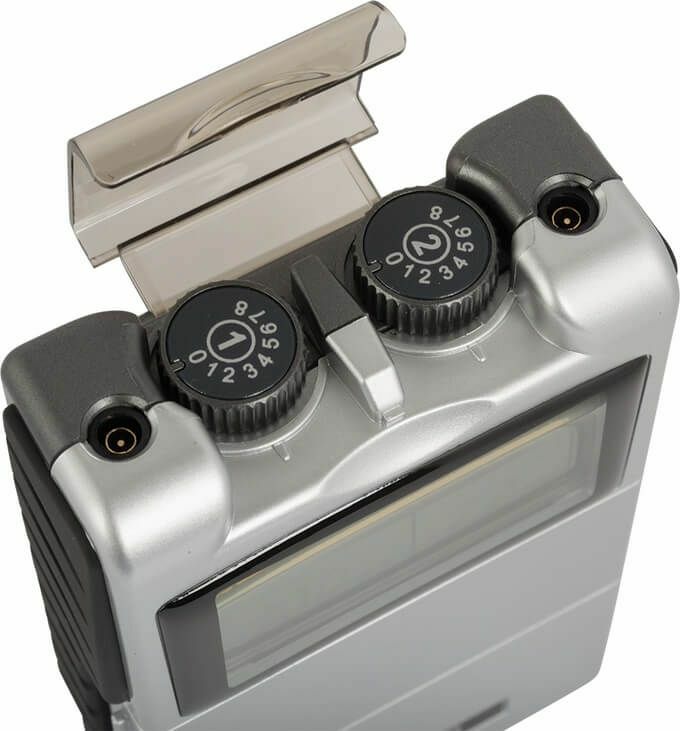 The LG-7500 has a built in compliance timer. The LG-7500 comes with a sturdy belt clip so you can easily wear when you are in the home or on the go. Use up to 4 electrode pads with this Dual Channel Unit. 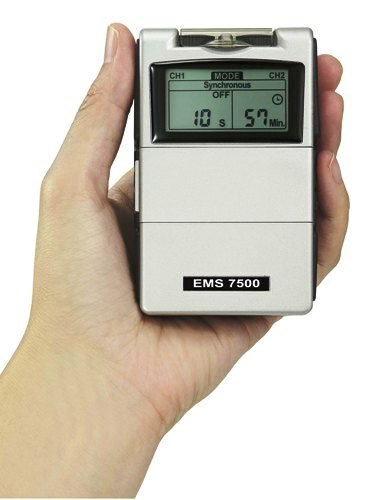 The LG-7500 Muscle Stimulator is used in offices, hospitals, and sports clinics for the treatment of muscular injuries, the re-education of paralyzed muscles, the prevention of muscle atrophy, and much more. The LG-7500 is perfect for improving muscle tone and increasing blood circulation. Muscle Stimulation is helpful in conditions where the reduction of physiological range of motion is due to or the result of fractures with consequent immobilization, operative intervention in shoulders, knees, and back. 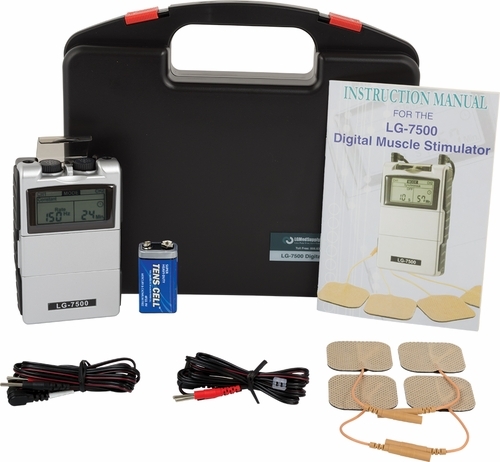 How does the LG-7000 Muscle Stimulator work? 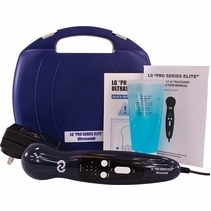 The LG-7500 Muscle Stimulator sends comfortable impulses through the skin that stimulate the treatment area. Because the stimulation of nerves and muscles may be accomplished by electrical pulses this modality can help prevent disuse atrophy. Incapacitated patients can receive therapeutic treatment to create involuntary muscle contractions thereby improving and maintaining muscle tone without actual physical activity. 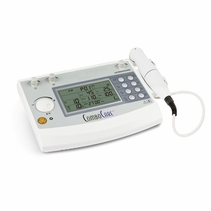 Muscle Stimulators transmit electrical pulses through the skin surface and stimulates motor units (nerve and muscles). The electrical impulses are "ramped" so that they closely emulate natural muscle contractions. 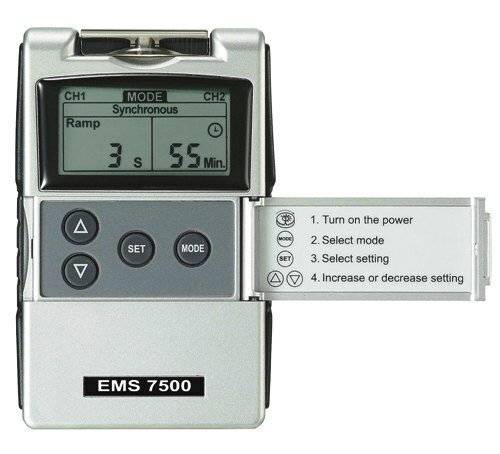 Electronic Muscle Stimulators (EMS) Stimulate, Re-educate, Massage, and Build Muscle. 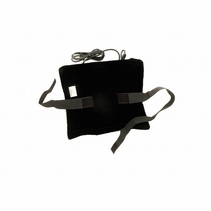 Electronic Muscle Stimulation is basically done by stimulating some areas of the body. 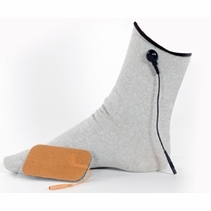 For this purpose, an electronic stimulation device is used - electrode pads are placed directly on the body area(s) that need to be stimulated. By dialing the voltage, you can pick different pressure on the muscles, that create various medical and cosmetic effects. 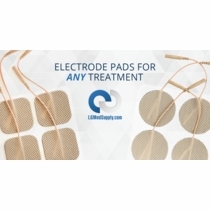 Simply Place the Re-usable Electrode Pads on the muscle area that you wish to stimulate and receive immediate relief and physical conditioning. Why use expensive medications with side effects when a more cost-effective, drug free solution exists? 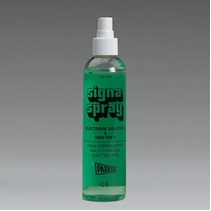 Optional Items you may wish to order with the unit are the 1) Electrode Preparation Spray which prolongs the life of the electrodes (pays for itself) by hydrating the electrode pad as well as removing body oil which erodes the electrode pads. 2) Battery and Recharger which is an excellent option which is a 9 volt battery and charger which will save you money in the long run. You will not have to buy more 9 volt batteries that can get expensive. 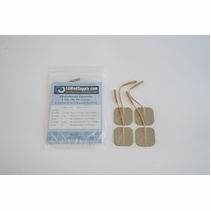 3) Extra Electrode Pads The unit comes with 4 Electrode Pads that last 20-30 times. At some point you will need additional electrodes so be sure to purchase some extras today! excellent device 5 excellent ems machine, did a great job on my lower back and my legs totally does what it is suppose to do. 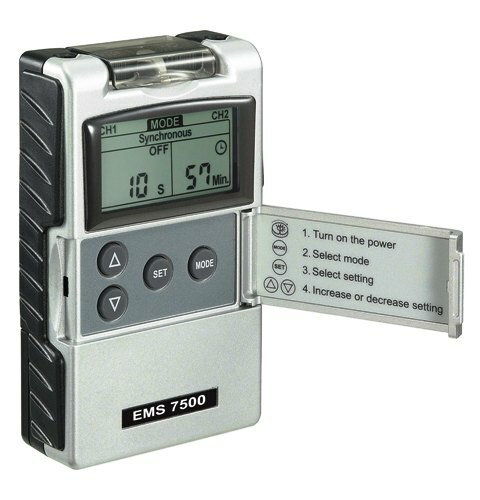 i seriously recommend this ems device. 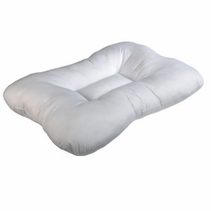 4 Bought on & for the functions the price is great. Would be nice to include a setting chart or booklet for areas to be worked with !!!!!!! 5 This is a great product. I am a believer in this therapy for chronic shoulder/neck issues. 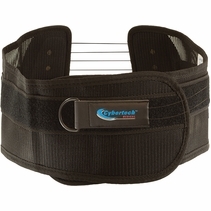 My PT uses one in his office and it makes a huge difference. For the price, this is a fantastic device. Easy, safe. I'm preparing to to on vacation which includes overseas flight... the seats on the planes for long flight created big problems last year - even with regular standing, stretching, etc. This year I'll be better prepared. This is my "to-go" support system.